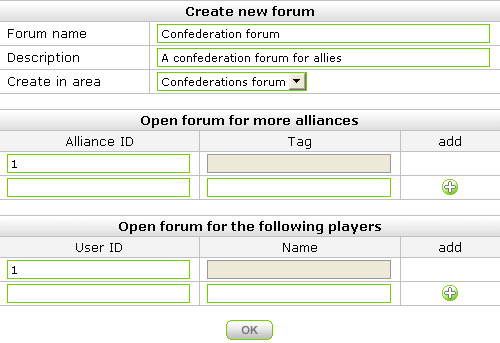 You can start making an alliance forum by clicking the button when you are in the 'forum' tab of your alliance menu. 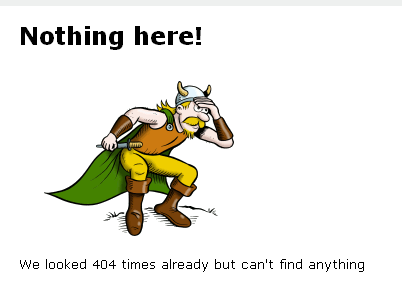 When you click this button, you'll see a menu for making a new forum. As already said, it is possible to add four kinds of forums. They are all described below. 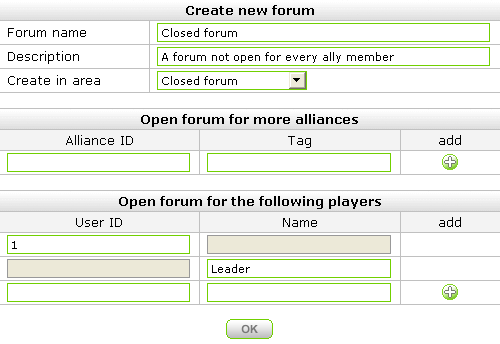 A public board can be read by anyone in the game, but can only be posted on by the members of the alliance which the forum belongs to. A board of this kind can be used for applications, announcements and more. This kind of board is meant for alliances and their wings. When you view the menu for making a new board like this, you will see you have to add alliances who are able to read and post on this forum. This can be done with the alliance ID or tag. Your alliance can always use the forum; you do not need to add it. Clicking the '+' icon in the list creates an extra list item to add an alliance in. This type of board works pretty much the same as a confederation board. The board can only be viewed and posted on by people added in the list you will automatically get when trying to make a new board of this type. Players can be added by their ID or player name. The board will not be visible to anyone but people added to this list and the board admin(s). Again, you can add another item to the list by clicking the '+' button. 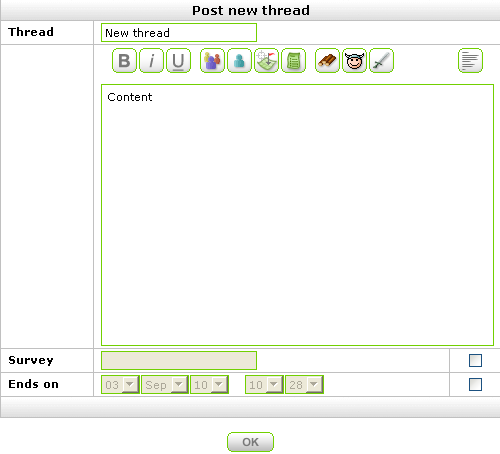 Below is an image of a forum you could get when following the steps used as examples above. Here the areas of the forum are marked. Red represents the public boards which can be read by anyone but only posted on by alliance members. Blue represents a board only accessible by members of alliances added to the forum. 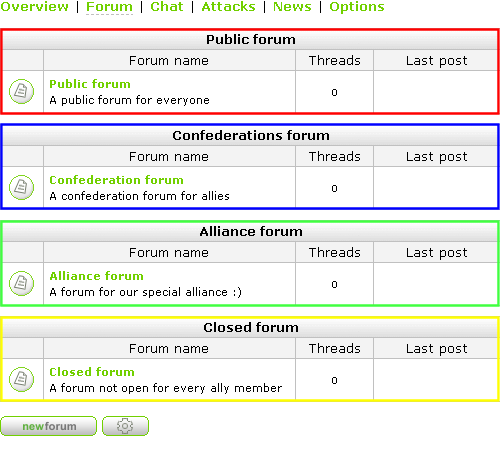 The green part is the alliance forums, which can be viewed and posted in by alliance members. Finally, yellow is a closed board which can only be read and posted on by players added to the forums.